It is animal assisted visits for people in need of comfort. We believe that a simple interaction with an animal has been proven to lower blood pressure, speed healing, increase circulation, and raise the spirits. Pet owners are even known to live longer than those who don’t own pets. Animals don’t judge – they just offer their unconditional love and support. When people find themselves in a difficult or stressful circumstance – a hospital stay, a move to a group home, or difficulty learning to read – they are often in situations where a loved family pet cannot be included. While it may not be the same as having their own dog there, having a sweet, fuzzy head to rub can go a long way to brightening someone’s afternoon! Therapy animals have a special aptitude for interacting with members of the public and enjoy doing so. They provide affection and comfort to various members of the public, typically in facility settings such as hospitals, retirement homes, and schools. Therapy animal owners volunteer their time to visit with their animal in the community. Animal-assisted activities (AAA) provide social, motivational, educational, and/or recreational benefits for people during interactions. These activities do not have to be overseen by healthcare professionals and do not work toward particular clinical goals. AAA often occurs in meet-and-greet sessions in a variety of settings and can be administered in groups or with individuals. Animal-assisted therapy (AAT) is a goal-directed intervention in which an animal is an integral part of the treatment process. AAT is directed and/or delivered and documented by a health/human service professional with a specific clinical goal for a particular individual in mind. According to Animal-Assisted Therapy-Therapeutic Interventions, AAT is not a style of therapy like rational-emotive therapy, cognitive therapy, behavioral therapy, etc. Instead, a therapist who utilizes AAT operates from his/her professional foundation and facilitates change in a client through the client’s interactions with an animal. Physical therapists, occupational therapists, certified therapeutic recreation specialists, recreational therapists, teachers, social workers, and others can incorporate AAT into their work and treatments in a multitude of ways. What activities might my pet and I do once we begin visiting? Your team has opportunities to visit all types of facilities depending upon your schedule and degree of comfort with the environment. Schools, hospitals, nursing homes and libraries are just a few of the places our pets provide support. During your visit, residents of the facility may pet, brush or simply look at your animal. Small animals may be carefully placed on an individual’s lap or even on their bed. This is only with their permission, of course. If your animal enjoys performing tricks then, they will have a grateful audience where the smiles are a mark of appreciation! Even though entertaining tricks can be fun for everyone, certainly they are not required to be considered an excellent Ambassador team. Sometimes, just sitting quietly next to an individual or listening to a child read is all that is expected! Can I be involved with AAT (Animal Assisted Therapy) even if I am not a healthcare professional? Yes! Visiting handler-animal teams are the most common source of therapy animals as they work with healthcare professionals and clients during therapy sessions. In these cases, the volunteer handler and the healthcare professional work as a treatment team. The handler has the responsibility of managing the animal while the therapist works toward the individualized treatment goals. This is a very effective way to utilize AAT because it allows the therapist to focus on the treatment and the handler to focus on the role of their animal. Where do WAGS teams visit? 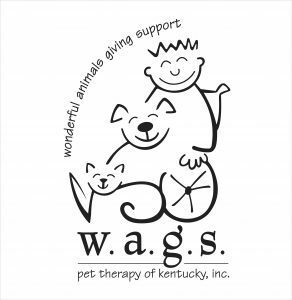 WAGS teams visit a multitude of facilities in and around the Greater Louisville area. Nursing homes, hospitals, detention centers and rehabilitation centers are just a few of the services where our visiting teams frequent. For a complete listing of the facilities, visit the Places We Visit page.